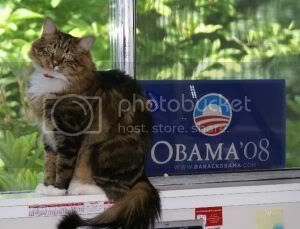 I Support Cats For Obama! Yesterday I used a picture of a cat with the Obama logo to show the similarity in Obama’s logo and Pepsi’s “smiles.” I promised that I would let you in on where I “stole” that picture from. I stole it from CatsforObama.com! Check out the site and look at the hundreds of cats who will be voting for Obama!